Some building materials like self-leveling flooring compounds ore plasters are applied in thin layers. These fast setting mortars set and harden within a couple of hours and subsequent drying of such a thin layer is generally terminated after the first day. In order to investigate the dynamics of early shrinkage and expansion we developed a special set-up of two laser units which are horizontally aligned. 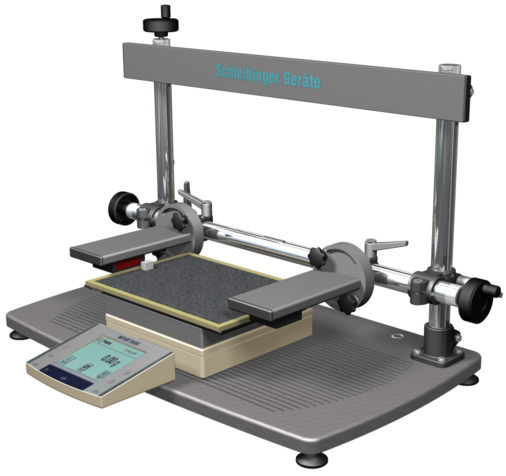 This set-up allows to investigate the different formulation parameters and their influences onto the different stages of shrinkage and expansion, namely the plastic shrinkage, setting expansion and drying shrinkage. The shrinkage/expansion behavior is strongly related to both, external (climate) and internal (formulation) factors. With respect to the latter, begin, intensity and duration of setting are key to the overall shrinkage/expansion behavior. 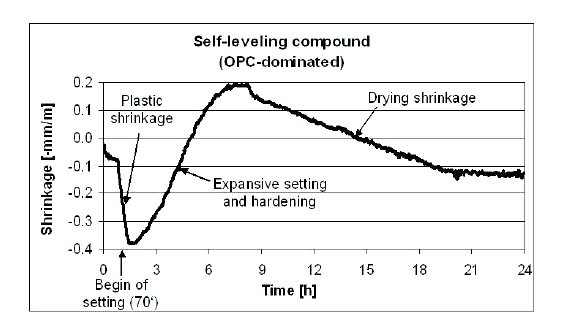 With building materials applied in thin layers shrinkage is one of the major issues because of two reasons: The high surface-volume ratio causes evaporation to be a dominant mechanism for strong and fast physical shrinkage, and the intense hydration reactions can cause a pronounced chemical shrinkage, or in case of Ettringite formation a strong expansion. mortar. A data-logger supplied with the system records the data and store it in the logger as standard ASCII files. A synchronous registration of temperature and humidity ore of a balance (Mettler, Sartorius, Kern) is possible. One thermocouple temperature channel and a mixed temperature-humidity channel are included. The logger has a network interface (Ethernet).So you can easily integrate it into local intranet. With a standard web-browser software you can readout the data ,and visualize it. For further data handling we recommend Microsoft Excel ® ore any similar visualization program. The data are visualized online graphical and numerical on the screen. No special PC software is necessary. You need only your browser-software like Mozilla Firefox, Chrome, Opera or Internet-Explorer ® . Look at a small video to see how it works.. The picture below shows a strong plastic shrinkage (shrinkage before setting) in the first hour. Close to the begin of setting, plastic shrinkage can turn suddenly into expansion. The current working hypothesis is that this is a pure structural effect related to a critical concentration of hydrates, which cause the mineral grains (cement, sand and fine-grained fillers) to become supported by a matrix of hydrates. From this moment on any further hydration causes the mineral grains to be pushed apart (expansion). The ongoing chemical shrinkage (caused by continued hydration), which contributed to plastic shrinkage before, is now producing porosity. As the hydration rate decelerates, evaporation becomes the dominant mechanism and forces the mortar layer to shrink again. In most cases, this drying shrinkage levels out during the first day and the mortar layer becomes stable in volume. Picture with courtesy of Bühler and Zurbriggen, elotex AG, Switzerland. At the elotex web site you can download the original paper. Kinetics, shrinkage, microstructures and material properties of self-leveling flooring compounds: A comparison of Portland cement and calcium aluminate cement dominated mixed binders. thermocouple temperature measurement type K for measuring the specimen temperature (sensor included). S0052 Shrinkage Cone Vessel for Mortar. Volume: 349 ml for mortar up to 2 mm grain size. The sample container can be connected to a temperature control unit (e.g. chiller order no. V0019). S0051 Shrinkage Cone Vessel for Concrete. You may turn the sensor vertically to use the Thin-Layer System as a two channel Shrinkage Cone setup. Volume: approx. 680 ml for concrete up to 8 mm grain size. Laser-reflector for placing on the specimen surface.